Pleasant Plains Workshop invites you to a night of beach blanket fun in the ‘sun’ in our new space next door!! Leave your winter boots at the door and slip on some flip flops. We’ll have the heat cranked up to 11 for ya! 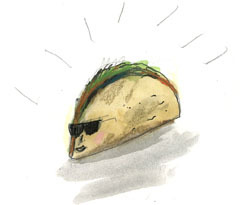 Other activities include a print your own taco print station featuring a design by PPW artist, Elizabeth Graeber. We’ll also have a suntan oil/self-tanner bar with a variety of products to get you out of your winter doldrums. Please bring some additional snacks or beverages to add to the indoor picnic! and get ready for some fun on this upcoming three-day weekend! Tickets are $15 and include taco bar, party activities, and Grizzly Beer (while supplies last). Please bring some additional snacks or beverages to add to the indoor picnic! and get ready for some fun on this upcoming three-day weekend!